Item # 309907 Stash Points: 2,495 (?) This is the number of points you get in The Zumiez Stash for purchasing this item. Stash points are redeemable for exclusive rewards only available to Zumiez Stash members. To redeem your points check out the rewards catalog on thestash.zumiez.com. Don't compromise your cute style with boring white crew socks! Pick up the Back To Basics 3 Pack No Show Socks from Stance. 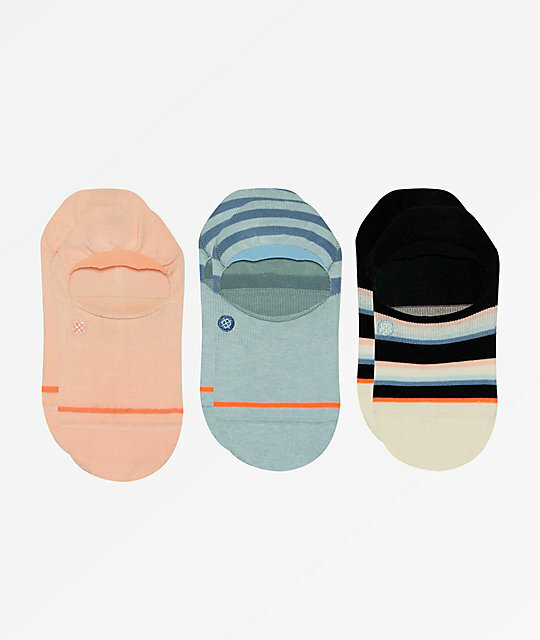 This pack of no show socks comes in three different colorways, including a light pink, light blue, and blue and black striped pair, offering a color for every outfit. Constructed with silicone grippers to combat heel slip, Ultra Lite Cushion, and arch support, these socks not only look good, but feel good too. Back To Basics 3 Pack No Show Socks from Stance. Pack contains 3 pairs of socks. Signature Stance logo embroidered at top of foot.